This completely new, mind-blowing spectacular showcases the jaw-dropping talents of seven of the most incredible illusionists on earth. 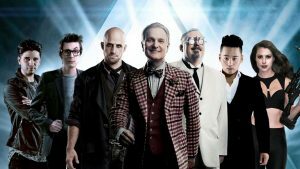 THE ILLUSIONISTS – DIRECT FROM BROADWAY has shattered box office records across the globe and dazzles audiences of all ages with a powerful mix of the most outrageous and astonishing acts ever to be seen on stage. The non-stop show is packed with thrilling and sophisticated magic of unprecedented proportions. Collectively these performers have been seen by millions of people around the world and this production showcases their incredible talents together on stage.